Fun, jolly and a little bit clumsy, clown hire has been a much-loved aspect of kid’s parties for many years. But there’s more to clowns than meets the eye! More than simply silly fun, clowns can offer games, music, storytelling and even learning activities. Traditional red noses, oversized clothes and silly jokes, no we’re not talking about Dad, but party clowns! Hire a clown for a kid’s party (or an event where you know there’ll be lots of children) and they’re bound to be intrigued, amazed and end up in a fit of the giggles. 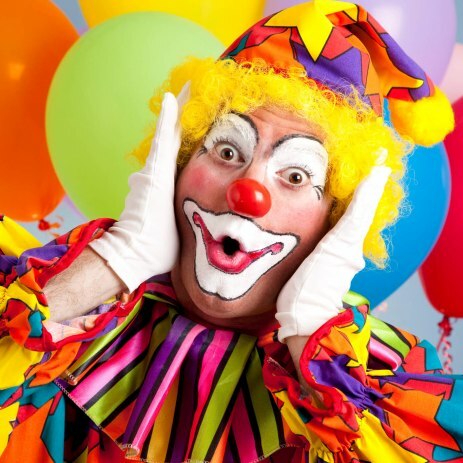 Many clowns may come armed with puppets, stilts, storybooks and circus tricks so whatever it is you have in mind for your kid’s party consider a clown for the ultimate children’s entertainment idea. Take a look at our clowns for hire here and submit a quote request form to find out more.